Researchers using NASA's Mars Reconnaissance Orbiter (MRO) have found eight sites where thick deposits of ice beneath Mars' surface are exposed in faces of eroding slopes. 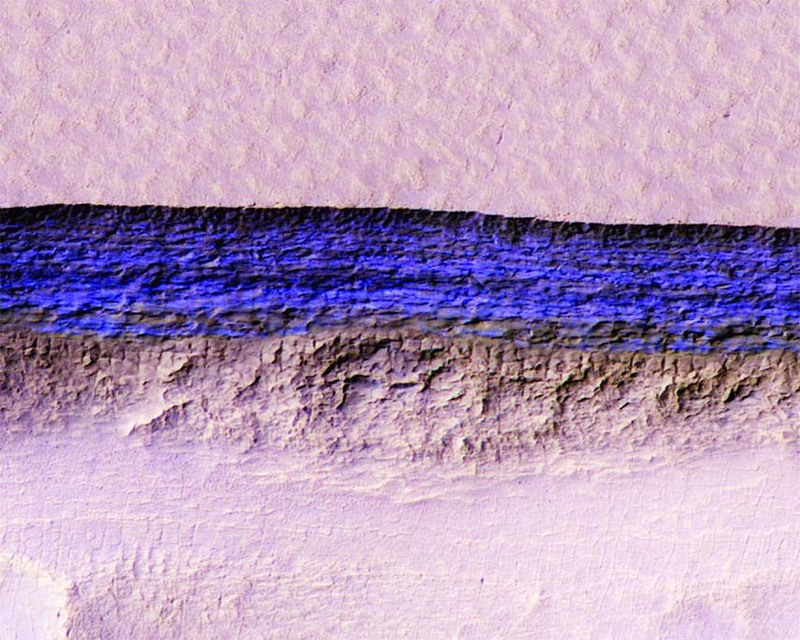 These eight scarps, with slopes as steep as 55 degrees, reveal new information about the internal layered structure of previously detected underground ice sheets in Mars' middle latitudes. layer one to two yards (or meters) thick of ice-cemented rock and dust. They hold clues about Mars' climate history. They also may make frozen water more accessible than previously thought to future robotic or human exploration missions. Researchers who located and studied the scarp sites with the High Resolution Imaging Science Experiment (HiRISE) camera on MRO reported the findings today in the journal Science. The sites are in both northern and southern hemispheres of Mars, at latitudes from about 55 to 58 degrees, equivalent on Earth to Scotland or the tip of South America. "There is shallow ground ice under roughly a third of the Martian surface, which records the recent history of Mars," said the study's lead author, Colin Dundas of the U.S. Geological Survey's Astrogeology Science Center in Flagstaff, Arizona. "What we've seen here are cross-sections through the ice that give us a 3-D view with more detail than ever before." The scarps directly expose bright glimpses into vast underground ice previously detected with spectrometers on NASA's Mars Odyssey orbiter, with ground-penetrating radar instruments on MRO and on the European Space Agency's Mars Express orbiter, and with observations of fresh impact craters that uncover subsurface ice. NASA sent the Phoenix lander to Mars in response to the Odyssey findings; in 2008, the Phoenix mission confirmed and analyzed the buried water ice at 68 degrees north latitude, about one-third of the way to the pole from the northernmost of the eight scarp sites.